Korihor, an antichrist preaching at the time when Alma the Younger was high priest over the land, convinced many Nephites that they should not believe in Jesus Christ or his coming atonement. He taught them instead various philosophies. In Korihor's phrases and arguments, modern readers can find parallels to many schools of thought, such as atheism, nihilism, and relativism, which have long dominated much of secular philosophy. This highly intelligent opponent's tactics were persuasive, but Alma retaliated with pure testimony and the power of God, eliminating Korihor's influence in the land. 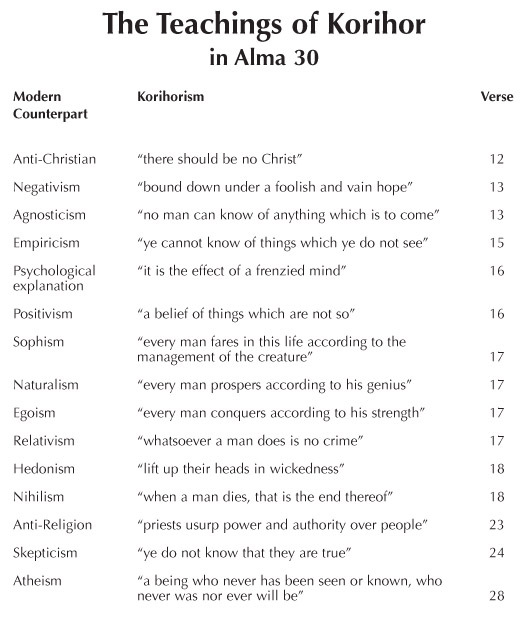 This chart lists each of the doctrines taught by Korihor in Alma 30 and a modern or standard philosophical counterpart.